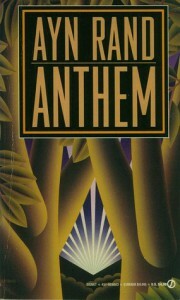 I know that one common criticism of Anthem is that it very closely resembles Zamyatin's We. That may be so, but since I haven't read the latter, I can't comment, nor fault Rand, for any supposed similarities between the two. I can only judge this book on its perceived merits. Another criticism seems to be that it contains absurdly one-dimensional characters. I agree, they are not multi-dimensional. But I'd respond, isn't that the intent? Certainly unique individuals with complex personalities wouldn't exist in the soul-crushing, repressive dystopia that we find in Anthem. So I can't fault Rand for one-dimensional characters, either; that, I believe, was deliberate and served to reinforce the theme of the story. I know very little about Rand's philosophy--just what has been filtered down to me third-hand--and therefore I'm fairly free from bias when it comes to her writing. I possess neither the bitter hatred, nor the sycophantic obsession, that some harbor for her. I thought Anthem was quite good, and that is that. Her prose, while not coruscating, was very readable and enjoyable. Like many other 20th century dystopian novels, this one goes the conventional "celebrate the individual" route. I will say, however, that in the 11th chapter, Rand probably went a little bit farther than others in her celebration of the individual. She is adulatory nearly to the point of obnoxiousness. Still, overall, for all its faults, I had a good time reading this slim little volume, and can't say I'm hostile to the overaching theme of the story. Nor am I hostile to the idea of reading more of her work, namely Atlas Shrugged and The Fountainhead. Perhaps it will make a detractor out of me, or perhaps it will make a new fan. Either way, I'll try to form my opinions from the books themselves, not the (I suspect agenda-based) interpretations of others.